One of my favorite things about the Christmas season is the deluge of festive events that seem to fall onto my calendar. This girl loves any excuse to celebrate! From weddings to holiday parties, I constantly find myself scouring my wardrobe for something new, fresh and festive to arrive in, and oftentimes that search can leave me empty handed. 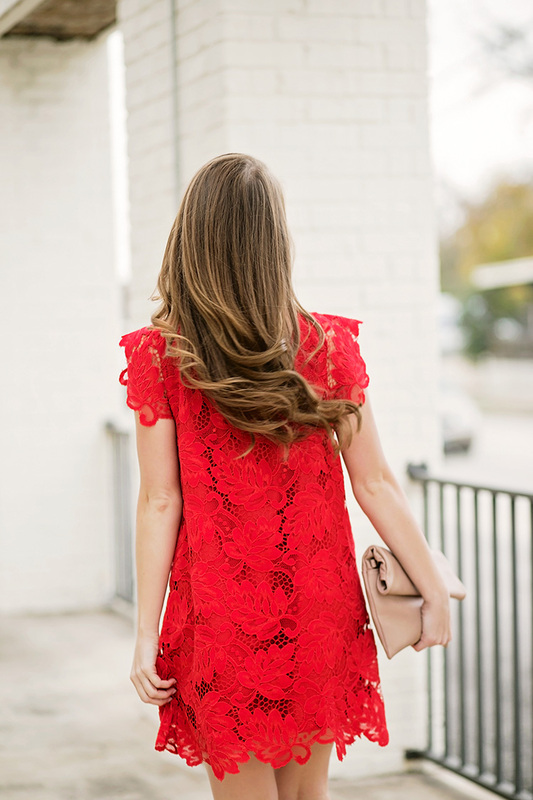 That’s why I found this red lace dress to be such an incredible find. The beautiful color, sophisticated cut and lovely lace detailing make for one show-stopping frock! And have I mentioned the price? You can take this beauty home for under $100! While I haven’t decided exactly what I’ll be wearing on Christmas eve, this is a definite front runner. And in terms of getting your money’s worth, I love that you can also wear this piece straight into summer, spring and fall with a pair of cute wedges or sandals! My mama and I arrived in New York yesterday around lunchtime, and did not stop until midnight last night! Today we’ve got some serious shopping on the agenda, as well as the light show that Saks 5th Avenue puts on. We caught the tail end of it yesterday and were blown away! Wishing everyone a happy Tuesday! P.S. A heads up on the sizing… this dress fits a little more on the roomy side! As such, I have on an XS. Hope that helps! Kate, you are absolutely stunning! This dress is just gorgeous and so perfect for the season! Great find! Holy smokes what a knock out red dress! I love it, Kate! Such a gorgeous dress! I’d love to get to NYC around the holidays. I haven’t had the chance to experience that magic!